Why Use Rules Instead of Geotargeting? Rules and GeoTargeting cannot be used at the same time. 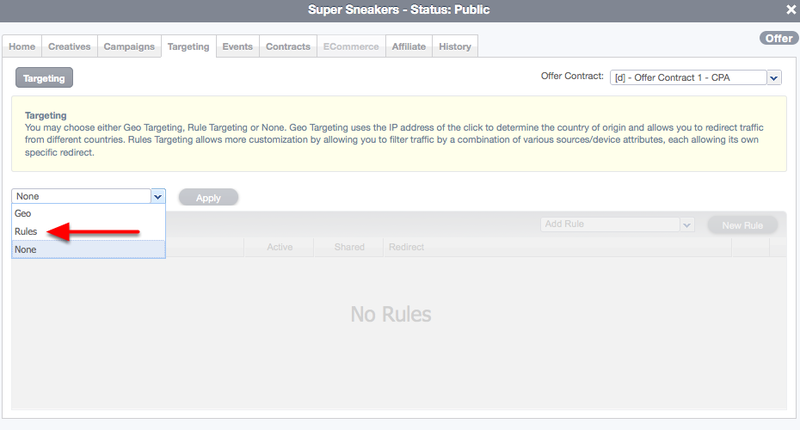 So, when the targeting you want to implement is more than simple country-based geo-targeting (drill-down into a more specific region or add another layer of rules that are not location-based), you will need to use rules. This is because geo-targeting only allows for a country-level targeting, where-as rules allow for much more granular targeting. When you first create an offer, there are no targeting rules set. 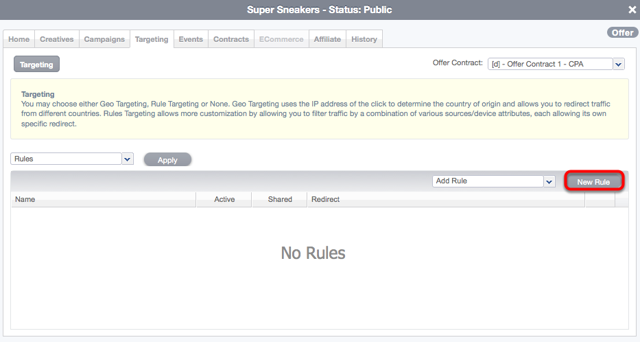 The Offer card's Traffic tab should look like the image above with the drop-down set to 'None' and the rules section grayed out, showing "No Rules". Name: Choose a name for your rule. Keep in mind that if you choose to make this rule available for use on other offers, you'll want to name this something fairly intuitive to make sure you recognize it later. Active: This must be checked for the rule to work, but if you're not comfortable with making your rule active just yet, you can activate it at a later time. Shared: You can select whether this rule should be saved for use on other offers. 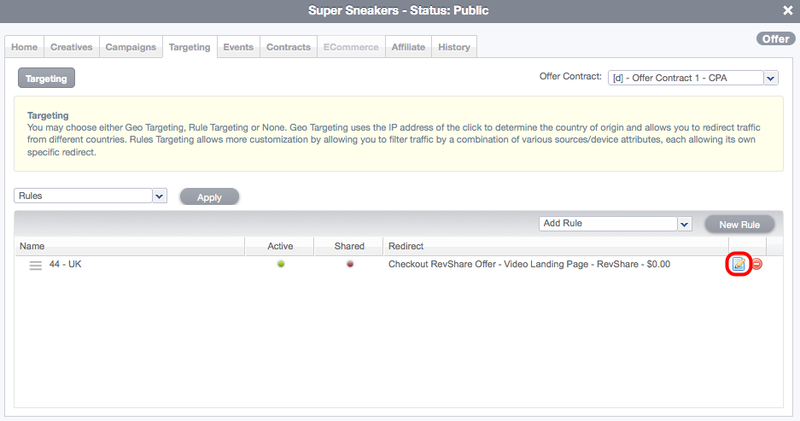 Any updates made to a shared rule will apply on all offers where the rule is applied. Now we will select the targets that CAKE will look for in deciding whether clicks should be redirected according to this rule or not. In our example, we've selected a 'UK' rule based on location so we have selected 'Location' from the drop-down which opened a new window so we can add the redirect countries for our UK rule. Select the country or countries by clicking on the green plus icons which will also display the selected targets on the right-hand side. When you see an icon to the left of the target, this indicates there are drill-down options. For country, the drill-down is for regions. For operating systems, the drill-down is for OS versions and so on. Once you have selected all your targets, click 'Save'. This will now take you back to the previous window where your saved target will display. If there are additional targets to add, please do so (for example, if the rule were specific to UK iPhones, we would still need to add a device-based target in addition to the UK target). Finally, if you have not done so already, please remember to activate your rule to make it live and click 'Create'. Once saved, you will be taken back to your Offer card where you can now see your new rule. If you need to edit the rule, you can simply click on the notepad icon to edit. 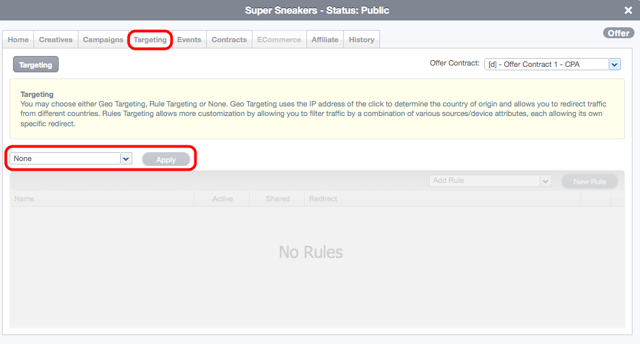 Should you have wanted to apply a rule that was already created, you would select the shared (saved) rule from the 'Add Rule' drop-down instead of creating a brand new rule.